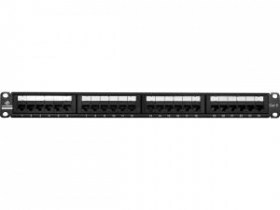 Computech's LB-PP126 by Linkbasic is a 19", RJ45 jack, 12-Port rack mountable patch panel. Each panel has cut-outs that accept snap-in jacks and each kit includes icon labels with plastic holders for easy port identification. Blank anodised panels can be mounted directly for easy port identification or can be mounted directly to an EIA standard 19" relay.